The ability to provide local hydraulic fluid power is an important feature for enabling all-electric subsea well control and intervention applications. Fluid power is required for e.g. grease injection, chemical injection or valve actuation, and the fluid media can be water based or other chemicals with different viscosity and chemical properties. Innova’s subsea electrical motor drive technology is developed with these requirements in mind. The RLWI Subsea Hydraulic Pump is an application of the subsea motor drive for providing hydraulic control fluid and grease for a Riserless Light Well Intervention system. Based on a modular design, the system consists of a 3kW electrical motor/drive unit and an interchangeable pump module. The pump module can be high pressure (690 bar) fixed displacement water glycol pump, low pressure (345 bar) fixed displacement water glycol pump, or high pressure (690 bar) grease pump. Other pump modules can be added via the SmartPump interface, which allows the drive control system to automatically identify the pump and sets the drive performance characteristics to match the specific pump’s profile. Being an integrated part of the RLWI control system, the Subsea Hydraulic Pump was designed working closely with the Client to ensure seamless interfacing. A wide range power supply and Ethernet based control, including a web browser control interface, was developed to simplify interfacing. A purpose-designed grease pump module was developed and qualified. The system is developed and qualified by Innova according to the ISO 13628-6 standard for subsea production control systems. 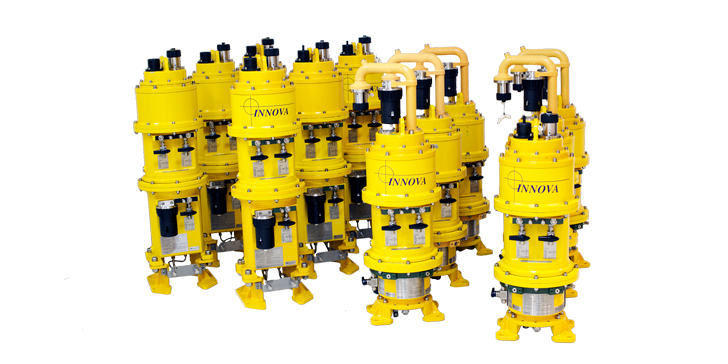 Development and qualification of the RLWI Subsea Hydraulic Pump system is an integrated developent process involving mechanical, hydraulic, electrical, control and software engineering, made possible though Innova’s unique multi-discipline development team.